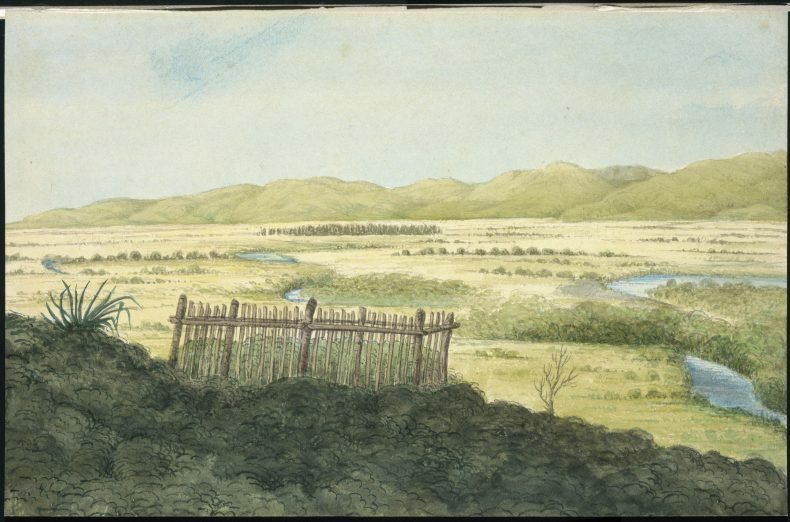 The story of the 1832 deed for the purchase of the Wairau valley from Ngāti Toa by Captain John William Dundas Blenkinsop. By Curator Historic Māori Visual Materials Matiu Baker. The 1832 Blenkinsop Indenture is best known for two things. Firstly, as a duplicitous land purchase agreement for the Wairau valley, which was later purchased by the New Zealand Company (N.Z. Co) in an attempt to wrest it from its Ngāti Toa owners with tragic results. And for the elaborate and expertly rendered pencil drawing of the moko (facial tattoo) that appears on the deed, long assumed to be that of Te Rauparaha. The circumstances around the events associated with the Blenkinsop Indenture and its key protagonists appears as a tragic sequence of coincidental relationships. A kind of ‘perfect storm’, that occurs out of the convergence of colonial artifice, greed and ambition. 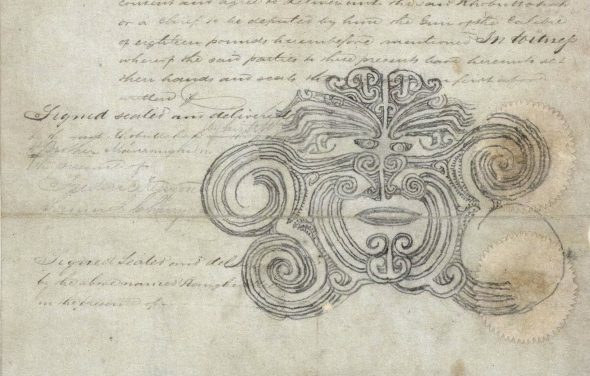 It’s also interesting to observe that the indenture’s elaborate moko, so long attributed to Te Rauparaha, may in fact represent another of its signatories. But more on that later. On 17 June 1843 an envoy of special constables led by Nelson Police Magistrate Henry Thompson and Captain Arthur Wakefield, principal land agent for the privately owned N.Z. Co., arrived at Tuamarina on the Wairau river to execute an arrest warrant for Ngāti Toa chiefs Te Rauparaha and Te Rangihaeata on charges of arson. The chiefs were charged with evicting surveyors from lands purchased by the company and setting fire to the buildings they had constructed the fertile, but disputed, Wairau Plains valley for future settlement. 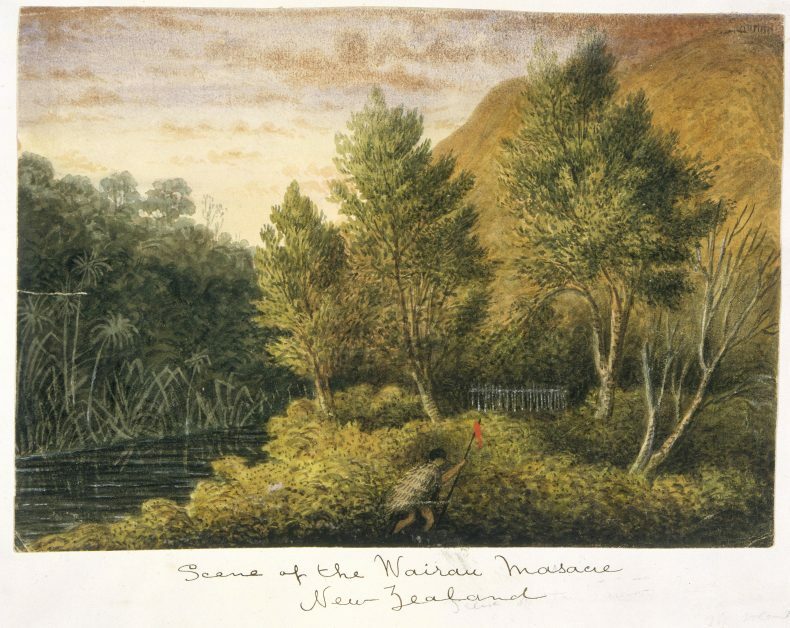 The resulting encounter, variously referred to as the Wairau Massacre, the Wairau Incident, and the Wairau Affray, remains one of the most notorious and bloody events of our early colonial history. 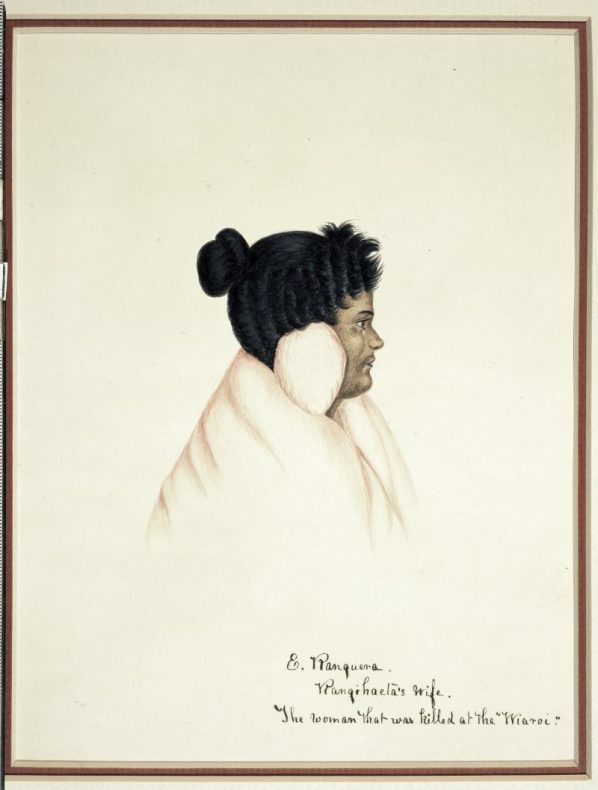 Thompson and Wakefield arrived at Tuamarina with 47 armed settlers to confront Te Rauparaha and Te Rangihaeata, who were encamped in a small clearing with about 120 armed men, women and children. Ngāti Toa had vigorously protested against N.Z. Co claims for the Wairau, which was premised entirely upon the company’s purchase of the flawed 1832 Blenkinsop Indenture. In response to Ngāti Toa’s protests the colonial government appointed Land Commissioner William Spain to investigate the purchase. But impatiently, and unwisely, the N.Z. Co saw an opportunity to prosecute the matter when Ngāti Toa evicted surveyors and burned their make-shift buildings. When an exasperated and intemperate Thompson pressed Te Rauparaha and Te Rangihaeata to submit to the warrant, willingly or by use of force, even producing the manacles with which they would be restrained, he unknowingly set in motion a tragic sequence of events. The tension was now palpable as Te Rauparaha and Te Rangihaeata refused to accept Thompsons’ terms. Thompson called upon his men to join them in a show of force when one of the party accidentally discharged his weapon while crossing the river. Ngāti Toa immediately responded and the two sides exchanged a series of volleys leaving dead and wounded on both sides. Among the dead lay Te Rongo, recently taken into Te Rangihaeata’s care after her husband Te Whāiti, Te Rangihaeata’s first-cousin, had died. Captain Wakefield ordered the men to down weapons and signalled their submission. Some of the party took this opportunity to quietly slip away into the surrounding bush. The remaining captives disarmed and rounded up, seated themselves on the ground. Before long an enraged Te Rangihaeata strode up the hill toward the group, according to some accounts casually dispatching the wounded as he went, until he arrived among the assembly demanding that Te Rauparaha hand over the captives to him as utu (cultural redress) for the death of Te Rongo. 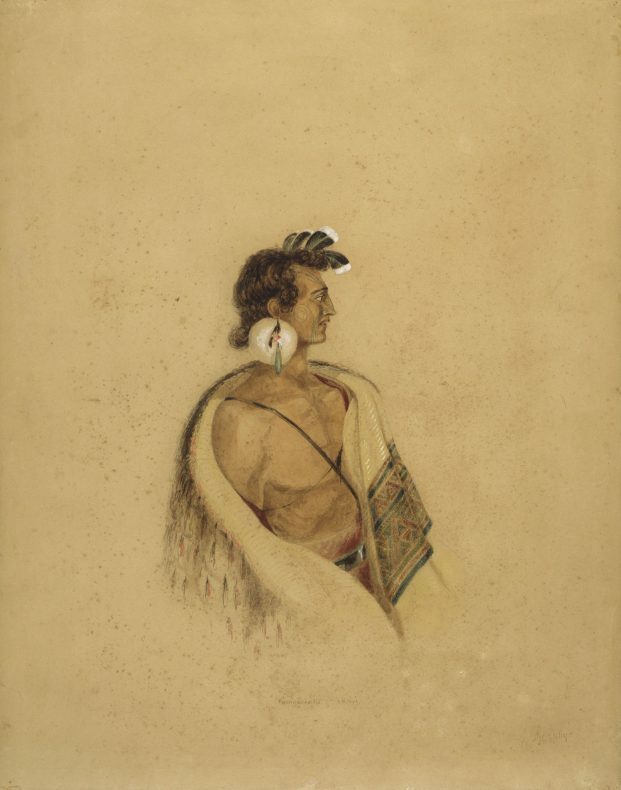 Te Rauparaha appealed to Te Rangihaeata reminding him that there were dead on both sides, but he remained unmoved. 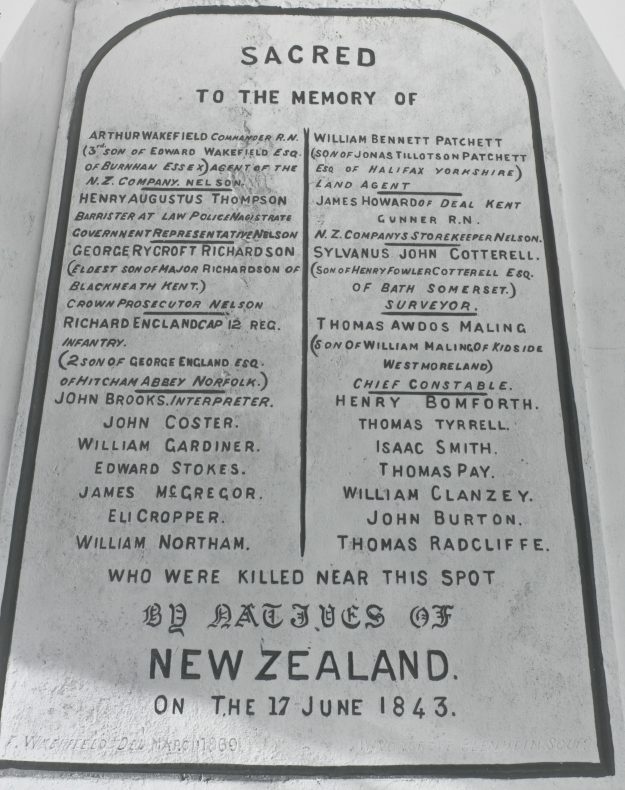 Te Rangihaeata executed Police Magistrate Henry Thompson, Captain Arthur Wakefield and several other captives, probably using his pātītī, a tomahawk made from trade axe-heads. In all, 22 settlers lost their lives that day, at least half of which left families behind. It struck fear into the hearts of the small settler town of Nelson, which was only established the previous year, and was the first major conflict of its type following the Treaty of Waitangi in 1840. Although it wasn’t to be the last. To know our history …both sides … is to begin on a path to peace and reconciliation. Thank you Ruth. Yes, ‘from knowledge comes understanding..’ as they say. My Great Great Grandmother’s first husband, John Brookes, was one of the settlers killed. He was Arthur Wakefield’s translator, obviously not a very good one! Emily, his wife, was left with two young children but she went on to marry my Great Great Grandfather and here I am. If it wasn’t for the Wairau I wouldn’t be here so there are some positives stemming from that disaster! Thank you for responding to the blog Nancy. I think poor Mr Brooks found himself in the wrong place at the wrong time. What I’ve always enjoyed is being able to locate yourself in the stories and narratives of our own unique Aotearoa New Zealand history. This is a really great post. Thank you, The illustrations add hugely, taking me back to the time of the “Incident”. Thanks again. Thank you Ian, glad you enjoyed it.